Koniga Rajesh completed his S.S.C in 2013 from Zilla Parishad High School, Oorvakal with 6.7 GPA. He joined in I.T.I (Electrical) and he had some backlogs. 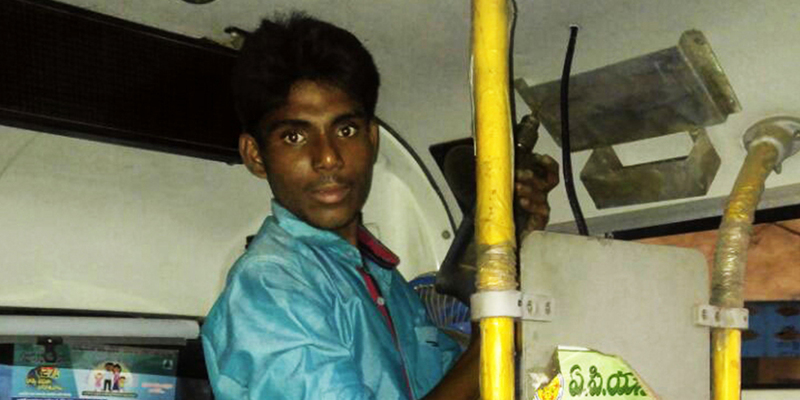 The 19-year-old Rajesh remained idle at home for a couple of months. One fine morning he met with the trainers from Don Bosco Tech who were distributing leaflet and information about skill training program in the mobilization drive held at his village. Rajesh introduced himself and called his parents immediately on knowing that the Don Bosco Tech Kurnool is offering free BASE training program in Electrical Domain with the support of Accenture project. In his family, he has six members in total which include him, his parent, two elder sisters and one younger brother. Sreenivasulu, Rajesh father, is a farmer by profession and sole bread earner in the family. His mother’s, Salamma, is a House wife while both his sisters are married at a very young age and his younger brother is pursuing his intermediate class from the nearby Government College. Being the eldest son in the family, it is an obligation for Rajesh to take up the household responsibility but knowing that he had backlogs he could not get his degree in hand. In this situation, Rajesh had to wait for another one year to clear his exams which practically did not work out as per the conditions of his family. After knowing the past of the Rajesh, Vasanth Raj – Trainer – Don Bosco Tech, insisted his parent to let Rajesh enroll and join Don Bosco Tech to skill training programme that will help to build his future. He along with his parents visited Kurnool centre of Don Bosco Tech for counselling and Interest Inventory Test to understand his interest. As an electrical domain student Rajesh had learnt the house wiring and the connections of bulb, fan and tube light including the lighting circuit. Though he is just an average graded student in the classroom, his dedication towards earning a better life for him and his family turned him be more enthusiastic towards learning. In addition to this he has gained awareness on Time management, Money management and on other life skill modules. After successful completion of the Electrical training, he got selected for” Uday Network Technologies” as a Technician Trainee and earning a monthly salary of Rs 8000/- per month and Rs 1500/- extra money for food expenses. Vasanth Raj (Trainer - Electrician) says, “Rajesh is very energetic in nature and have got great confidence to learn Electrical, English and Basic IT”. With the support and guidance of Mr. Ameer (Trainer – CE and ITeS), he was able to crack the interview perfectly.